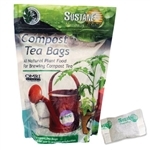 Organic compost tea is a treat for your plants. OMRI listed. All natural plant food for brewing compost tea or using as a root booster pack. Used by avid organic gardeners with dual purpose. Steep in a watering can overnight and water plants with a rich brew of nutrients. Won't burn plants or over-fertilize. Ideal for indoor plants. Easy absorption. Or place in hole as you are putting your plants into the ground below the root for a slow release, nutrient rich plant food. Can be used on flowers, vegetables, trees and shrubs. Our OMRI Listed Organic Compost Tea Blend was created for people interested in gardening without the use of chemical fertilizers. Our balanced compost tea blend, when actively aerated in in our compost tea brewer incubates a microherd of aerobic, beneficial, micro-organisms that can be immediately applied to soil and plants. These organisms quickly go to work to break down biodegradable materials, creating nutrients in the soil to promote rich and healthy plants. Our compost tea blend comes from a great farm in Rhode Island. The Organic Compost Tea Starter Kit includes everything you need to start providing your plants and garden with the benefits of our O.M.R.I. Listed Organic Compost Tea Blend. You can also brew your own compost tea from your own compost and aerate with our brewer. This kit and the tea both come from a great farm in Rhode Island.